I have touched some factors from experience that i remember from my education and from research over the years. It may sound obvious what I am going to discuss again. One of the most difficult things with a multi-tool is reaching places sometimes. If it is possible to turn a bolt or a nut with the cut area(pipe wrench area) then you are ok. This is sometimes absolutely not the case and you would have to improvise. Damage the equipment is not fun. 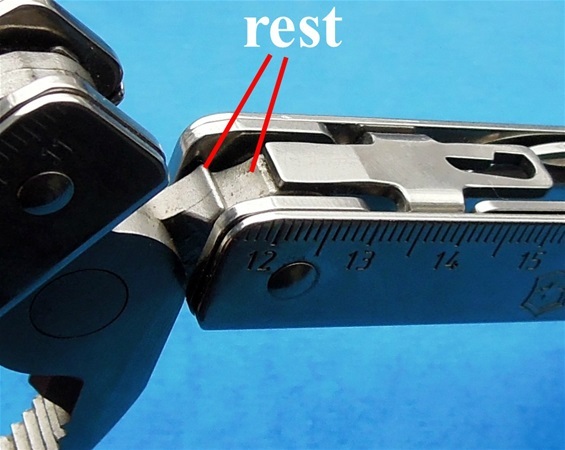 There is also a leap from the handle on multi-tools towards the plier so you would sometimes have to hold the cut area in the pipe wrench on an angle. That is not easy. What you then would have to do is use the front section of the plier. With a needle nose design then there would be a possibility to break the plier tip. With the SwissTool hybrid design you may have a better and stronger design. It is in my mind a hybrid between a blunt and needle nose design no matter what others may say. It got the angle on the tip that would make it possible to reach for a grip with more surface and material on it. This you have on a needle nose design too but not as sturdy and with less surface. The long tip would prevent good contact. Remember that the SwissTool is very sturdy and the usual tasks would not hurt the plier at all. It can do very hard things and that is the idea and knowledge that could be for safety. I know what it can do! 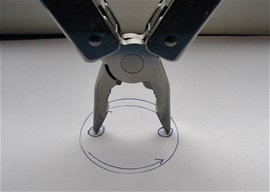 In a situation the plier can be used to turn a lid. It is not recommended. If the tip was flat it would be better. 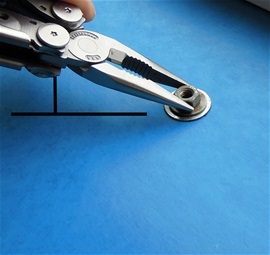 The tip on the hybrid pliers is with an angle to compensate for the extra size and hybrid construction. This is how i see it. Maybe the angle tip on the hybrid would dig into the surface and turn as well? Anyhow it is good! The guide unit with support for the plier in open mode is interesting. It is not any weak point on the SwissTool. The little flex you feel is only at the beginning of the press when you apply force on the handles. On the pictures you can see how it rests towards more surface than one. 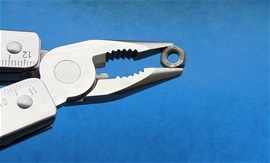 This design makes the comfortable action that people recognizes with the Swisstools when you open and close the plier. It is the mix of the Hummer and a Limo all in one. This design in my mind helps for the correct angle on the plier and it helps for the force applied during gripping. This design locks the plier in open mode very well. Here is one more position for use on a lid, usually not recommended depending on how hard it sit. This guide-unit is a Swiss Master design and it is used to hold the attaching for a corkscrew and it is for a lanyard. 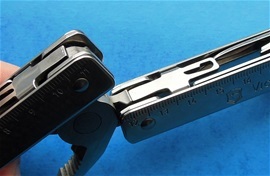 This guide unit is responsible for the action and it holds the tang of the plier in position when using the ruler. This guide unit is balanced for all the tasks. 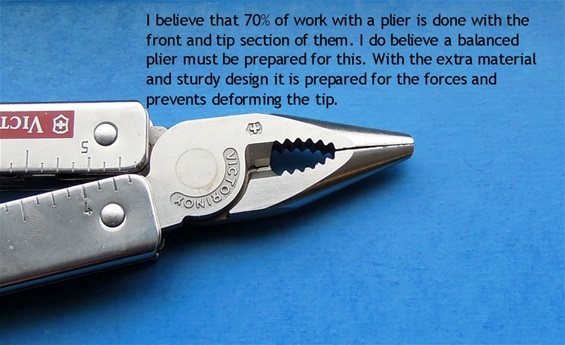 In the discussion and articles on Sakhome.com you will find research on the hybrid plier. On the picture to the right you can see one major important factor. We know that a needle nose plier sacrifices some strength for fine control. This lack is clear when you use it like on the picture if the nut is hard to turn. 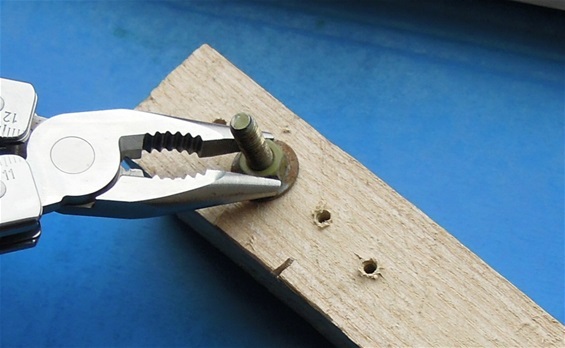 If the only way is to turn a bolt/nut holding the plier like so then the needle nose can get damaged because you must use much gripping force and there is not enough surface and it will slip. The hybrid is better here as well. This is the kind of tasks combined with bending that damages the needle nose pliers. One entity when you are locked onto a device. 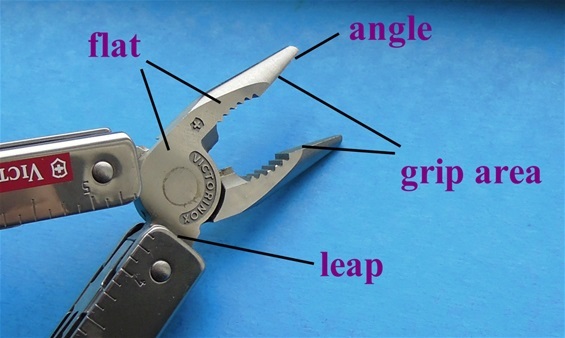 In the world of multi-tools you will find many designs and types of pliers. I like the needle nose pliers because it will go a long way. The key is to have the correct tool for a job or task. In many situations a multi-tool is used because people do not bring other tools with them. The designated professional tools needed for harder or mechanical tasks for example are not brought along. It is then the multi-tools are used and in situations there people exaggerate the use and forget the breaking point on steel. The key with the hybrid design is that you have a plier that would take the little extra. They will break or get damaged at one point too. The SwissTool is a professional multi-tool but it cannot replace designated professional tools. It can fulfill everything in between and some extra when necessary. The SAKs and Multi-tools got that tendency to fit sometimes when designated professional tools do not. That said. Maybe lids are not the best word for what i mean, caps could be better. Some screw caps got depressed parts, slots or other details that the two jaws can be used agains and turned. I guess most have seen different devices that such could fit. Good luck! On this picture you see a high quality needle nose plier. Let us imagine the problem I touched in the article on this page. Let us imagine you cannot lower the handle any more towards the surface. You cannot use the pipe wrench (cut part in the middle) and you must use the tip of the plier. If you have a bolt-head or a nut that must be turned then this may be the only way to do it. Either so or holding the tool vertically. A needle nose is not comfortable for this. 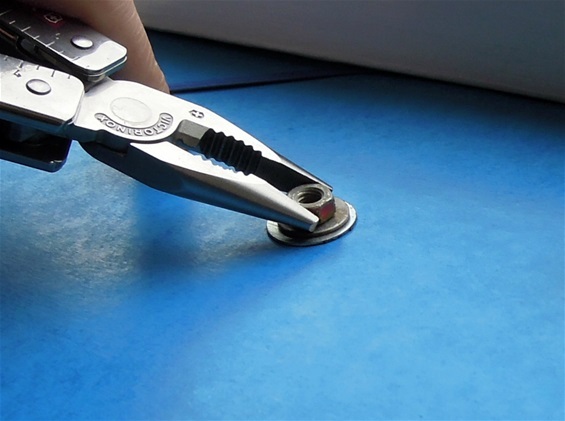 The cut serrations on the front or tip on the plier can be used on the edges turning a bolt. 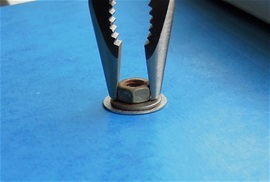 I like the best to take advantage of one flat side and let the cut serration grab the nut or bolt on one edge. I use a firm and secure grip turning the bolt. Depending of the gap or angle there will be necessary to use one side flat towards the plier jaw and the other on an angle towards the edge. Then you have the issue with the second angle depending on use like explained above. It is an advantage with the extra material in my philosophy.